Due to inherent limitations of various minimally invasive modalities of treatment for symptomatic calyceal diverticula, proper patient and treatment selection are crucial to successful outcomes. Miller et al. proposed a detailed patient-selection algorithm for retrograde intrarenal, percutaneous, and laparoscopic approaches derived from a purely technical standpoint (Fig. 1) (18). Several key factors determine the ultimate uro-logic intervention, including degree of overlying renal parenchyma, diverticular size and location, and presence of retrograde access. Any lesion with thinned overlying renal parenchyma is amenable to laparoscopic calyceal diverticulectomy. ■ Conversely, those lesions with thicker overlying parenchyma that are not endoscopically accessible may require formal laparoscopic partial nephrectomy. 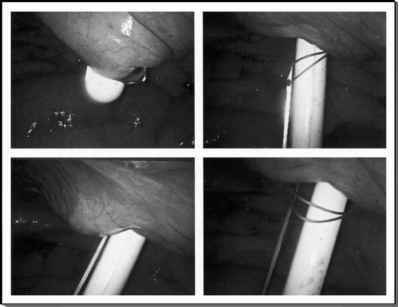 ■ Lastly, repeated endoscopic treatment failures may be best managed with a definitive laparoscopic approach. In the era of minimally invasive surgery, one must emphasize the role of well-informed patient preference in selecting treatment modalities—patients often opt for the least invasive or least morbid procedure, while accepting the fact that a secondary procedure may be necessary. For example, when the indication for intervention is recurrent infections, hematuria, or pain without stones, definitive management of the congenital anomaly is desired, and therefore a percutaneous or laparoscopic approach is preferable. However, if technically feasible, an initial attempt with an outpatient retrograde intrarenal balloon dilation or laser incision of the diverticular neck may provide temporary or even long-standing symptomatic relief, and may be preferred in the setting of a functionally solitary kidney.